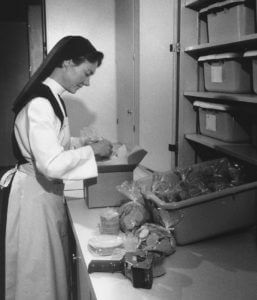 The Trappist Cistercian Nuns at Santa Rita Abbey founded Cistercian Altar Breads in southern Arizona over thirty-five years ago. Our contemplative monastic way of life is one of prayer, lectio divina, manual work, and community life. 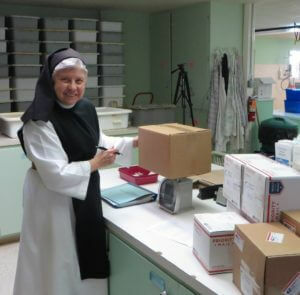 Our altar bread work enables us to support our monastery and to share with the poor. We actively cultivate an atmosphere of prayerful recollection at our work, and we like to think that our prayer is an extra special ingredient in our altar bread recipe. 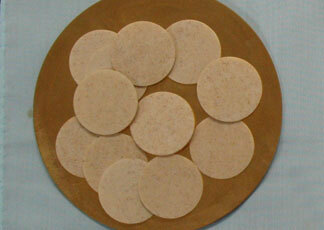 It is a both privilege and a joy for us to prepare the bread which becomes the Body of Christ for the People of God! 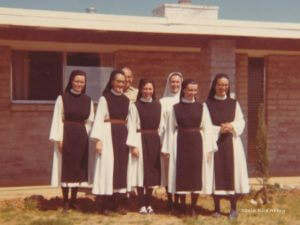 Our monastery, Our Lady of the Santa Rita Mountains, was founded in 1972 by Mt. St. Mary’s Abbey, Wrentham, Massachusetts. In the late 1970’s they took their first steps in the altar bread industry. We began Cistercian Altar Breads with one baking plate, a one-at-a-time people’s host cutter, and a handful of altar bread parish customers. Over the course of three and a half decades, our production capacity and our customer list have grown tremendously. Today our Sisters produce millions of high quality whole wheat altar breads annually for over 300 churches all across the United States. It was our intrepid Mother Victoria (just Sister Vicki back then) who got our bakery started. Now it is our Sister Rita who plans our baking and cutting schedule, keeps all our specialized equipment going, and handles customer orders. All of the Sisters in our community have worked in the bakery over the years, and most of us still work there now. 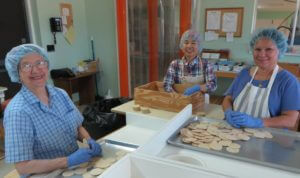 We are assisted by two wonderful employees, who mix the altar bread batter for us. Four of our Sisters take turns baking the breads. Two of our Sisters run the computerized cutting machine, and everyone helps with sorting (quality control), bagging, and clean-up. We love our work and we love working together. We feel blessed that we can earn our living in this deeply meaningful way. 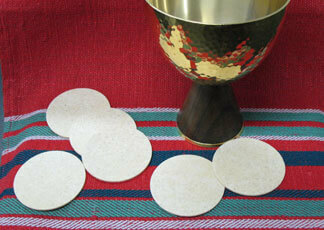 We keep all our altar bread customers in our daily prayer, most especially at the Eucharist. 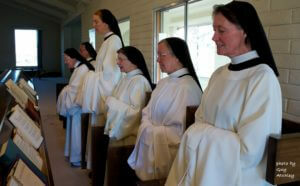 The Trappist Cistercian Nuns at Santa Rita Abbey have been baking altar breads for over thirty-five years. It is a joy for us to prepare the bread which becomes the Bread of Life for the People of God, and we like to think that our prayer is an extra special ingredient in our altar bread recipe. Cistercian Altar Breads are 100% whole wheat and are baked according to Roman Catholic liturgical norms. 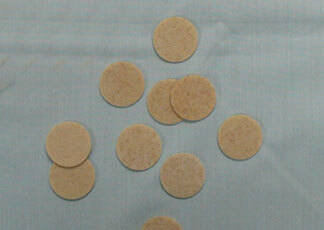 Our breads are approximately 1.5 mm in thickness, and come in five different sizes. Three people’s sizes: 1-1/8″, 1-3/8″, 1-1/2″; and two priest’s sizes: 2-1/2″ and 5-1/2″. All our breads are plain, without any markings, except for the 5-1/2″ bread which can be ordered either plain or scored for easy breaking into 16 pieces. To contact Cistercian Altar Breads: phone 520-455-0481 or toll free at 888-878-1622; email cistercianab@gmail.com; or use our online order form. 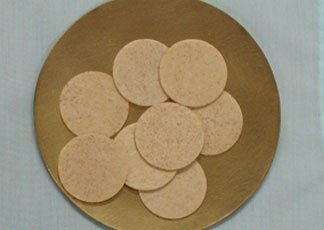 Our 1-1/8″ host is our smallest altar bread size, and is commonly used for communion to the sick. It comes in bags of 500 hosts. This is our most popular altar bread size, significantly more substantial than the 1-1/8″ breads and more economical than the 1-1/2″ breads. It comes in bags of 500 hosts. 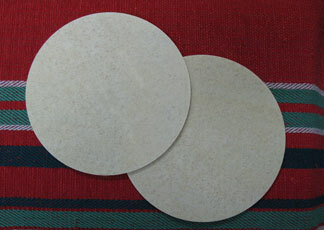 The largest of our people’s sizes, this is for a parish which desires a slightly more substantial bread than the 1-3/8″. It comes in bags of 500 hosts. This is the smallest of our presider breads. Just right for breaking into four pieces. They are available in bags of 30 or of 50 hosts. These breads are scored for easy breaking into sixteen pieces. 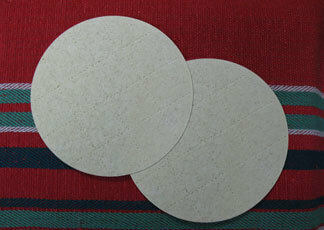 Large enough to be seen well in a large church, and also appropriate for a small group Mass. They are available in bags of either 10 or 25 hosts. These are the same size as our Scored Concelebration Hosts, but without the score lines. Large enough to be seen well in a large church, and also appropriate for a small group Mass. They are available in bags of either 10 or 25 hosts.